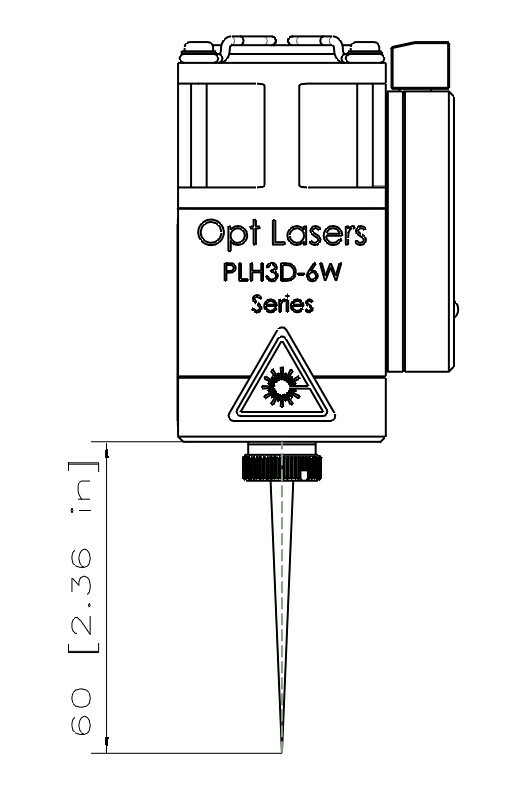 PLH3D-6W-Hobby Engraving Laser Head is Opt Lasers’ 3-rd generation of affordable lasers for hobbyists. It uses the same high power diode and excellent quality machined aluminum design and controller as XF version but has a simplified cooling system with the fan providing 15 m3/h that is suitable for less demanding tasks. The PLH3D-6W Series Adapter for X-Carve is designed to make electrical connections between the laser head and the Inventables™’ X-Carve® machines, easier and quicker. 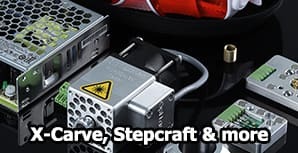 Inspired by the thoughts of our customers, to simplify electrical connection and speed up this process, we made The PLH3D Series Adapter for Stepcraft CNC Machines. The adapter for engraving laser head is universal, it can be used between most of the Stepcraft CNC Machines and all PLH3D Series Laser heads. These laser glasses can help reduce the probability of light entering the user’s eye from diffusely backscattered laser light. This product is OD 7+ over the range of 190 to 540 nm, blocking deep ultraviolet to green including violet and blue light. The universal PLH3D-6W Series Adapter designed for all types of CNC/3DP machines. Allows connecting to any type of the CNC controller output connector and any type of signal modulation. Everything you need is included! This EleksLaser Holder allows quick installation of PLH3D-Series laser heads on EleksMaker CNC plotters and adjustment of Z-axis. It has mounting holes for PLH3D-Series laser heads or LaserDock Magnetic Docking Station to facilitate the convenient change of tools and prevent contamination of the laser when it is not in use. This is a tool designed for adjusting the focus of the laser beam on our PLH3D-Series with the High-Resolution Lens. It is valuable to quickly change the focus of the beam when a different working distance or focus spot size is desired, often depending on the material properties or other constraints of the application. This Mounted Aspheric lens is useful to collimate or focus laser light in the visible wavelength regime. The aspheric design nearly eliminates spherical aberration without needing multiple optical elements. It has a broadband AR coating of 400-700 nm, allowing it to be used for various applications. This Mounted Triplet lens can be used to variably focus or collimate the laser light with reduced aberration due to its triplet (three element) design. Its relatively long effective focal length (EFL) of 8 mm allows it to focus laser light to a small spot. Affordable high-quality design – forget other a low-cost option when you can have the same outstanding design known from other Opt Lasers products for affordable price and availability of additional accessories and software that improve your productivity. Cutting and engraving - allows to cut and engrave on various materials such as wood, cardboard, rubber, paper, textiles, leather, plastic, balsa, plywood, and many others as well as a mark on stainless steel, titanium and low heat conductance type of steel. For more check Manuals and Articles section. Factory set lens - the laser head is shipped the High-Resolution Triplet lens installed and adjusted to focus at 60.0 mm (measured from the front-face surface of the laser head to engraving plane). This focal distance has a well-optimized focal spot size which is suitable for many engraving and cutting applications. This is the best-optimized focus distance to start with! Input signals versatility - build in driver allows accepting a variety of signals 0 - 5 V analog signal and 0 - 5 V, 0 - 10 V or 0 - 24 V for PWM/TTL signal. Driver built-in inside the laser head - Opt Lasers is the first company who integrated the laser diode driver directly into the laser head. 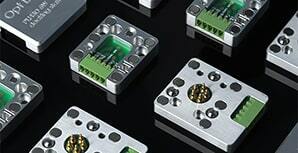 A short connection between the laser diode and a driver ensures better protection for a diode, possibility of high-frequency current modulation as well as eliminates inductance effects during the switch-on. Accepts a wide range of power supplies - 12 - 24 V, an integrated high-efficiency DC-DC converter is adjusting the input voltage to proper diode compliance voltage. This reduces the amount of heat generated and ensures over-voltage protection. No additional cooling required - a dedicated shape of the laser heads provides the best possible cooling method for a 6 W laser diode. 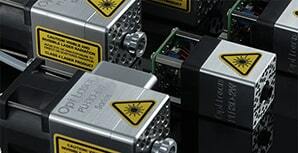 Many prototypes have been made to find the best solution for cooling the laser diode. The current design allows the laser head to warm up only by 8-10 degrees Celsius after a whole hour of constant work at full power. Two types of the lens included - The High-Resolution Triplet Lens with lens adjuster has a relatively long effective focal length (EFL) of 8 mm, which allows it to focus laser light to a small spot. All 6 lens surfaces are coated with anti-reflection (AR) coating centered at 450 nm. It is usually preferred for engraving a thinner line, cutting a thicker material due to the reduced convergence and divergence, or when a long distance between the laser head and the plane of the object to be engraved is necessary. High-Efficiency Mounted Aspheric Lens is designed to obtain as much as possible power from the laser diode. Its short effective focal length (EFL) of 4 mm makes a variety of working distances possible but makes the focus spot almost twice bigger compared to Triplet Lens. This lens should be used for engraving thicker lines on wood or plastic. This type of lens is used without the lens adjuster since they need to be mounted closer to the laser diode. Silent fan - provides 15 m3 of air output which is efficient for cooling and smoke removal that keeps the lens clean. Because of its quiet work, it will not disturb your inmate or neighbor. Or your beloved pet. Compatible with accessories for ease of use - ease of work is very important to us. As well as safety. Many accessories we produce are high quality, made on CNC machine parts which make the work easy and safe. Please check out the accessories we prepared for the PLH3D series. Your productivity and creativity depend on the right tools. The laser head has two separate controls. Modulation Input #2 accepts 0 - 5 V, 0 - 10 V or 0 - 24 V for TTL/PWM and turns on the laser when the voltage exceeds 2.5 V.
Important: The laser head should be powered from a high-quality power supply without anything else connected. 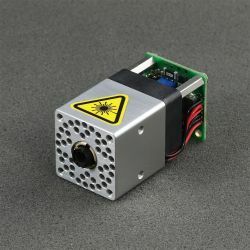 Please note: connecting the laser head to the same power supply unit as a stepper motor or any other high-impedance equipment is not recommended. Doing so may cause damage to the laser diode. - Soft start for diode protection. - CW Mode and Input Control Mode. Opt Lasers is a laser diode drivers manufacturer. Thanks to our experience building over a few years we created a very high-efficiency driver with low power consumption and low heat production. Additionally, it is the fastest dedicated laser head driver available on a market accepting signals up to 30kHz. Using 6W laser with high speed is no longer a problem while engraving small details or making small radius turns because the driver is able to read all needed signals. CNC controllers are able to send modulation signals with a high speed so 50kHz is not a problem to them. This is why a high-speed driver is a must in such a device. The driver is able to read 30 000 instructions every second what creates great precision and resolution in terms of power control. Also, maximum driver current is 6 A so using it with 3 - 4 A value ensures offset and long lifetime of a driver. 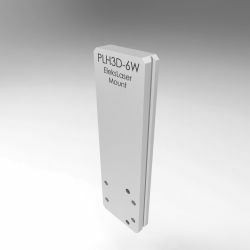 The PLH3D 6W incorporates a thermal protection system that protects the laser diode from overheating to maintain its lifetime. The unit is designed to automatically shut off when the housing temperature exceeds 47 C. The analog input is protected by a 5V Zener diode in a case on occasion there appears the voltage higher than 5 V. Despite everything, this input should not be used with higher voltages due to a risk of damage. 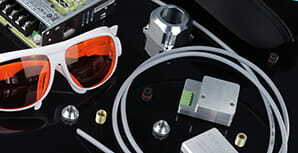 The laser diode is protected via a Schottky diode, which protects it from a reverse voltage and ESD. In addition, the integrated driver is fully covered to protect it from metal chips in a CNC machine environment. The focus distance can be quickly set or changed via the included lens adjuster (no additional tools). The driver of the unit is integrated directly on the laser head. This greatly increases the maximum modulation frequency and allows longer cables to be used. Besides the standard functionality, the small beam spot allows the possibility of using this product for rapid PCB prototyping. This is done by illuminating the copper layer of plates after a photosensitive paste is applied. This lightweight 190 g (6.7 oz) laser head requires no additional cooling. The body acts as a heat sink, and the fan design allows it to function as an air nozzle protecting the lens from smoke, while also cooling the laser head. Performing tests on several prototype designs allowed us to optimize the heat sink’s shape and enable efficient cooling while maintaining the module’s notably small form factor. The laser head allows engraving or cutting of materials such as wood, stainless steel, paper, leather, cardboard, and many others. For materials that generate smoke when engraved or cut, we offer an optional nozzle that is attachable to the front of the unit via magnets built into the laser head (see accessories). For bulk orders, the PLH3D series can be customized to all customers' needs. We can add customers' logos and all possible additional features. Customization is offered for a 3D printer and CNC manufacturers and distributors. Note that this list is being continuously updated. Please contact us if you have any questions or feedback regarding compatibility. Remember that it is not a toy. Laser radiation is dangerous even when scattered or reflected from any surface. Always use proper protection laser filter on your CNC machine dedicated to 430 - 480 nm in order to avoid reflected radiation. Never point laser head at people or animals. Do not touch the beam, it may cause burns or other injuries. Do not stare at the beam or the beam spot while the material is being cut. Laser radiation - Avoid eye or skin exposure to direct or scattered radiation.